Yahushua’s Words, and His example, can both be seen in the New Testament writings. They reveal to us exactly when the Feast of Passover and the Feast of Unleavened occur. But there is a problem. These details of Passover, including the timing of the Passover Supper, are not easily seen by a casual reading. Instead, they are concealed, and hidden within both the Old and New Testament writings! Not only are the New Covenant issues of eating of the flesh and blood of the Passover Lamb concealed, but likewise the Scriptural timing of when to eat the Passover Supper is concealed. The hidden-ness of these details is part of the mystery of Passover. So how can we solve the ‘mystery’ — how we can see and understand the words and example of Yahushua, concerning the Scriptural timing for eating the Passover meal? To find the answer, we will first look at some interesting features of the four Gospel writings. The four Gospel writings give an accurate portrait of life in Yahushua’s day. The Gospels reveal to us not only the truths of the Words and examples of Yahushua, but also the popular traditions, as well as the ‘doctrines of men,’ prevalent in Yahushua’s day. Here in the Gospels we see many of the popular traditions of the Pharisees. Although contrary to the written Scriptures of Torah, these traditions are nevertheless accurately revealed, both in the Gospels, and in the epistles — but they present the reader with a confusing mixture of ‘Doctrines of Men’ mixed with Truth. The result is that most casual readers of the Gospels (and the epistles) are not able to distinguish Truth of Scripture from tradition. Some traditions thus appear as common ‘Scriptural’ practice. And so this confusing mixture of truth and tradition, as accurately presented in the Gospels, overshadows and conceals many of the truths of Yahushua’s obedience to Torah in every detail, whose obedience is for our example. This confusing mixture seen in the Gospels also appears to many to be a source of discrepancies and contradictions. Little do we realise, that this ‘mixture’ of Truth and tradition functions as a means of separating out those who hold fast to the words of Yahushua, no matter the apparent opposition, from those easily swayed away from His words. This ‘mixture’ of Truth and tradition also functions as a built-in deterrent, even as cherubim holding a flaming sword, who keep the Way of the ‘Tree of Life’ — the Way of Messiah — to prevent unauthorised persons from approaching. That is, this ‘mixture’ of Truth and tradition seen in Scripture serves to filter-out all who do not hold to the Truth of Yahushua’s Words, that is, those who are not committed to walking in them. In Scripture, there are only two bases for discerning what is Truth, and what is tradition. One must either follow the words and examples of Yahushua; or he must dig deeply into Torah, in order to verify each word and example seen in the New Testament writings. When the apostles Paul and Silas presented the Truth of the Gospel to the Bereans, we are told the Bereans were more ‘noble’ because they searched the Scriptures daily, to see whether those things were so. (The Scriptures they had were the Torah, the Prophets, and the Writings, what we call the ‘Old’ Testament writings). Since we are told that the Bereans were more noble for searching the Torah to verify New Testament teaching, we conclude that we should do the same (Acts 17:10-11). And so although the details of the Passover and its timing are not readily seen by a casual reading of the New Testament, they can be seen, nevertheless, by careful and prayerful study of the Gospels regarding the words and examples of Yahushua, which can then be confirmed in Torah. So if one would sort out Truth from tradition, as presented in the New Testament writings, he must do one of two things. He must either develop a ‘perfect’ understanding of Torah, from which to see the error of tradition (no one but Yahushua has been able to accomplish this) — or else he must follow the simple Words and examples of Yahushua! Now, let us notice carefully, that the Scriptures reveal that it is only because of Yahushua in our lives, that we can accurately understand Torah! (Lev 26:10; Matt 13:52). This tells us that unless Yahushua has been ‘birthed’ within the person, whereby he is said to ‘Born-Again,’ he cannot see the Kingdom, or its workings (John 3:3). And to those who have been Born-Again, Yahushua will pour out His Holy spirit, to lead them into all Truth (John 14:26, 16:13). And as we saw in Part 1, in Isaiah 8:16 we are told the testimony of the Torah is closed up, and ‘sealed’ as to its prophetic meaning, except to those who are Messiah’s Disciples. When the Disciples were walking with Yahushua on the road to Emmaus, it was only after they had walked along with Messiah for a time, that their eyes were opened. Only after walking together with Him, walking in His footsteps, hearing His Word, and only after sitting down to eat with Him — did they know Him (Luke 24:16,31). We too, if we would have the ‘eyes’ of our heart opened, in order to know Him (John 7:17), must first walk together with Him, while hearing His Word, and doing His will. In order to have our eyes opened, that we might see His Word, understand His Word, and know His Word — and thus truly ‘know’ Him — we must first become “DO-ers” of His will. Let us briefly review how we can do His will, and as a result, have our eyes opened. Here we are told that the Father’s will is for everyone who sees the Son (Yahushua), and ‘believes’ on Him, may have everlasting life. But what does it mean to ‘believe’ on/in Yahushua, according to the Scriptures? Let’s briefly review this important topic. At this point, let’s recall our objective. We are looking for the Biblical timing of Passover, including the Passover supper. But in order that we may find the true timing of the Passover meal, we must first solve the ‘mystery’ of how we can see and understand Yahushua’s Words, and His Example. 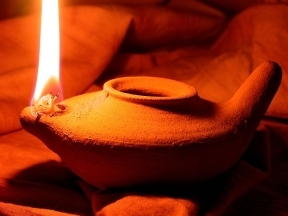 We then saw in the Scriptures that only after He opens our eyes can we see, and ‘understand’ the secret or hidden mysteries of the Kingdom — which include the details of Passover. And to have our eyes opened, we must do His will — that is, we must ‘believe’ on Him. And so now we must find out what it means to ‘believe’ on Yahushua. We saw that as New Covenant Believers, we have inherited Abraham’s example of what it means to believe in Yahuweh. We saw that Yahuweh accounts, reckons, imputes, and considers our belief in Yahuweh as our Righteousness, in exactly the same way as Yahuweh did for Abraham. We saw further that the word ‘believe,’ from the same root as the word ‘faith,’ is a gift from Father, and can not be earned by ones own efforts. We saw the first stage of Believing pictures one who Hears Messiah’s Words, and who receives, and ascribes Truth to, all of Father’s Word. We also saw the first stage as analogous to the planting of a Seed in a garden, and pictures the Seed of Messiah being birthed in the heart of the Believer, whose heart is receptive to the Word, as a garden ready for the Seed. We saw that the 2nd stage of Believing portrays one who, through maturity, becomes a “DO-er” of Messiah’s Words, of which Messiah tells us they are not His Words, but are Father’s Words. We saw that the 2nd stage of Believing is analogous to the growth of the plant, and the producing of its Fruit. We saw further that as the plant continues to grow, it goes on to become a Tree in the midst of the garden of the heart. We saw that the Tree producing the fruit is Messiah Himself, living within, having been earlier birthed in the heart of the Believer, When Father planted the Seed in the garden of the heart. We saw that the Fruit produced by the Tree is the Fruit of Righteousness. We then saw that the Tree from which the fruit originates is known as the Tree of Righteousness, which is none other than Messiah living within the Believer (Col 1:27; Luke 6:44; Php 1:11). We then saw that the Fruit of Righteousness consists of the works of Righteousness — of keeping all the Words of the Father, which in total are called “Torah” (Instruction, teaching) of the Father. We saw too that the Fruit (works) of Righteousness produced by a tree not planted by Father, are nothing more than filthy rags, and tares, for they are of (originate from) the works of the Law, but are not of (originate from) the works of Messiah. Having been birthed within, Messiah-in-us then desires to grow to maturity; and as we allow Him to do so, He will mature, and will produce in our lives the Fruit of Righteousness, the works of obedience to Torah. Finally, we saw that the Biblical Truth of what it means to ‘believe’ in Yahushua has been corrupted and twisted by man-made doctrines. The result is that the majority of Believers today do not hold to a belief that is according to Scripture, but have only a mental agreement to certain facts in the Scriptures, which we saw is a Greek-oriented, philosophical idea, void of any action. We saw that this form of belief is merely a ‘head knowledge’ of the Scriptures, rather than the ‘Doing’ of the Scriptures, and is thus contrary to the Scriptural definition of Belief and of Faith, as displayed by all the men of Faith, from Abraham to Zacchaeus. We saw that the devils hold this same form of ‘belief,’ and they tremble (James 2:19) — for they know the ‘judgments’ of Scripture (Yah’s ‘House Rules’) are true, thus even the devils know they will soon see Yahuweh’s punishment upon the ungodly. Even the devils know that this mental agreement form of ‘belief’ can not rescue them. We then saw the Scriptural Truth of ‘believing’ in Yahushua is not in being a Greek-oriented, thought-oriented ‘hearer’ of the Words of Scripture; but rather, believing is in becoming a Hebrew-oriented, “DO-er” of the Words of the Father. We saw that ones thoughts are revealed by his actions. Only by ones actions can his Faith be then seen as either non-Biblical or Biblical Faith. We saw in Scripture that the Prophets spoke of the eventual end-time battle, whereby the Hebrew-oriented, “DO-ers” of Torah would be the overcomers, who would prevail over the Greek-oriented ‘belief’ system of hearing the Torah, but not the doing of Torah (James 1:25). As we become “DO-ers” of Torah, we begin to notice that Father opens our eyes, that we might understand His Word! As we follow the logic in the above statements, we see that in order to have our eyes Opened, we must become “DO-ers” of Torah. That is, our eyes are opened when we become “DO-ers” of Torah, when we simply do as Messiah did while He was on earth, for our example today. Now if Yahuweh opens our eyes when we do His will — and if His will is that we believe on Yahushua whom He has sent — we may now conclude that Father will open our eyes when we do His will–and His will is that we choose to be a “DO-er” of Torah. And so if we choose to obey every word that proceeds out of the mouth of Yahuweh (His Torah), and we purpose in our hearts to do so, He will open our eyes to see, and to understand how we may obey all His Words. If, however, we choose to hold on to tradition, our eyes will remain shut, and we will not be allowed to ‘see’ His example in Scripture. We will thus not be able to see and understand the Feast of Passover, nor to keep it in the proper way — nor at the proper time. When Messiah walked on the earth, He ‘Believed’ on the Father. Messiah kept all of Father’s Word (the Torah), and in doing so He produced the Fruit of Righteousness. Those who are a part of His Bride, will be just as He is. Now we can see more easily, how Believers in Messiah are called to be just as the Bridegroom, and are called to produce the Fruit of Righteousness by becoming “DO-ers” of Torah. Stick with me, Dear Reader, for we are almost ready to see Yahushua’s words and example regarding the timing of the Passsover meal. 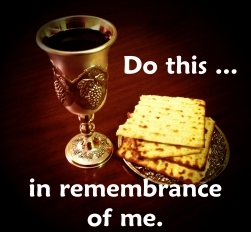 Communion: A Man-Made Substitute for the Biblical Passover – Also called the ‘Eucharist’ and ‘Lord’s Supper,’ this man-made substitute is a counterfeit of the Biblical Passover meal eaten by Messiah and His disciples the same night in which He was betrayed. This counterfeit has been passed down to us over the centuries, and today continues to be practiced unknowingly by most evangelical Believers. Eating Things Sacrificed Unto Idols: A Warning to the Bride – The Full-length article. The New Covenant Passover: A Mystery – Full List of Passover Articles, with Descriptions and Links.